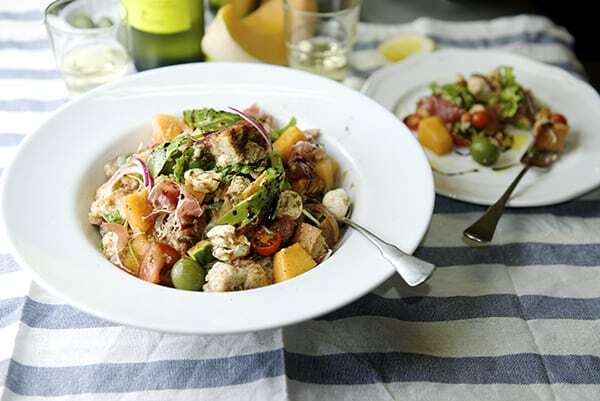 Panzanella Melon Salad ~ Yes, more please! My mouth waters for this Tuscan Salad! If we go back to the 16th century the Italian poet Bronzino, he praises the onions with oil and vinegar served with toast. Later on, when the tomatoes arrived to Europe, they were incorporated into the salad with other ingredients like cucumbers and capers. I’m not a food historian but it is of great interest and curiosity to know where food comes from, and the origin of dishes throughout history. Knowing these facts can sometimes lead you through perfecting a recipe, or re-inventing it. In this case I need to reinforce it because bread, onions, oil and vinegar simply are not gonna do it for me. 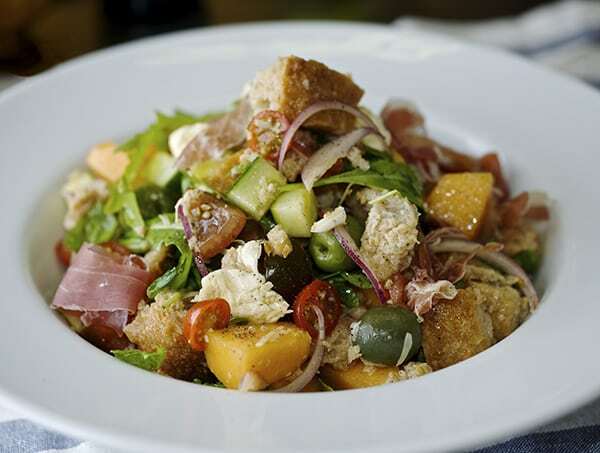 Many different versions of this traditional Panzanella Italian Salad can be made. From the type of bread, tomatoes, cucumbers, capers, onions, and a simple vinaigrette. One of the keys is goods Extra Virgin Olive Oil and Red wine vinegar. Playing a little bit with the sweet and savory notes, I added Cantaloupe melon for sweetness and some prosciutto for a salty meaty note. 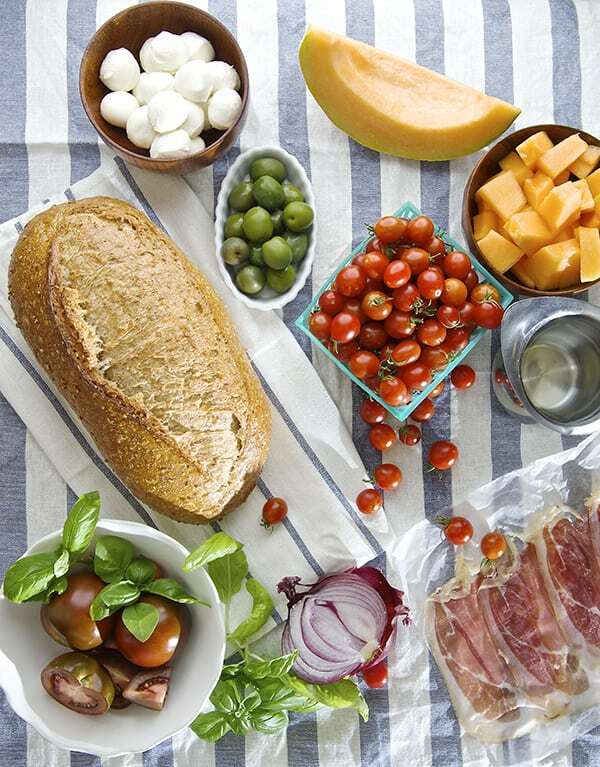 This would be just the thing for a summer picnic; something to combine all the flavors of the season. I like this salad texture and contrast, and that every bite has a different flavor depending upon what you pick with your fork. All these flavors on your palette produce a very savory and mouth-watering experience. Imagine, the crusty bread cubes absorb the juices from the tomatoes and the vinaigrette; that combined with the crunch of the onions, salty olives, juicy tomatoes and sweet cantaloupe with cracked pepper… the result, I just want the shade of a tall tree to dine under and my bread to be older. 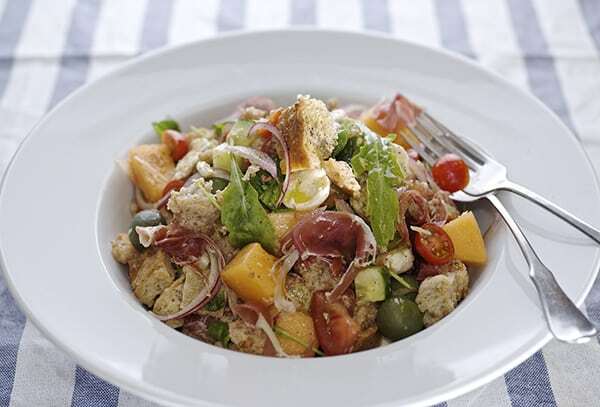 I hope you like my version of my version of Panzanella Melon Salad…Enjoy! ½ loaf day old Italian or French crusty bread. ½ red onion cut into slivers. ½ cup green Castelvetrano olives. 1 cup of bite size (bocconcini) Mozzarella or regular size cut into bite size cubes. 1/3 cup good quality fresh extra virgin olive oil. 1/4 cup red wine vinegar. Fine sea salt and freshly ground black pepper to taste. 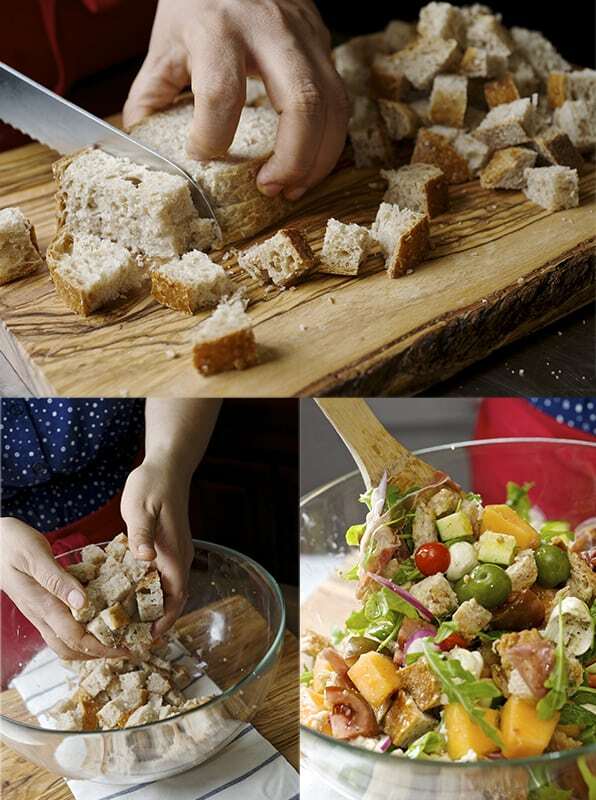 Start by cutting the bread into bite size cubes. If your bread is not a day old you can toast it in the oven at 350 F/175 C for 3-5 minutes. In a big salad bowl whisk the olive oil, red wine vinegar salt and pepper. Add the onions, tomatoes, cucumber, mozzarella olives and bread toss them lightly. Let the salad absorb the flavors for 15-30 minutes. 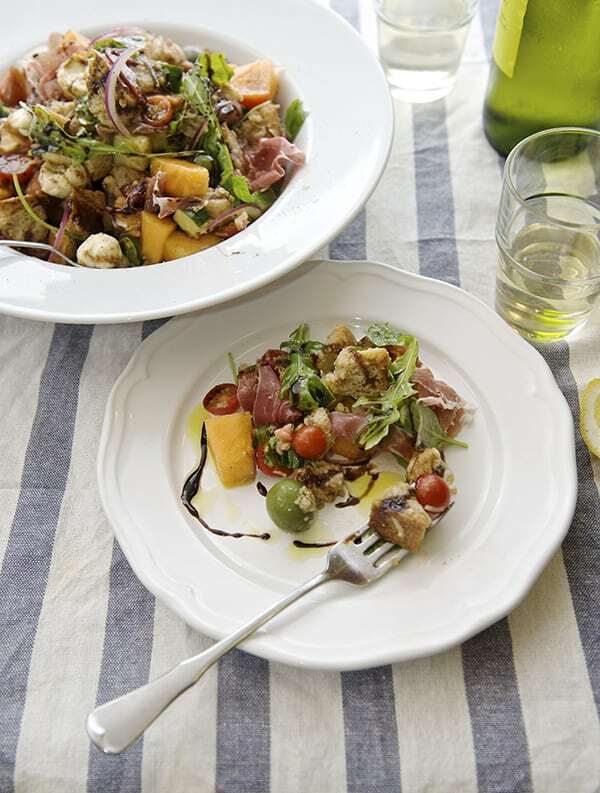 Before serving, toss the salad and tear and sprinkle the basil leaves and prosciutto over the top. It’s best to serve this salad room temperature with a chilled glass of white wine…I hope you like it as much as I do. When serving, drizzle some balsamic vinegar for sweetness. *For a Vegan or Vegetarian Version, you can omit the prosciutto and mozzarella. Instead add some roasted red bell peppers it will be a great complement. Mouth watering Salad for the sumer…Enjoy!